Unenlightened beings are the karmic cause for the existence of unenlightened samsaric realms. Their individual and collective karma actually manifested the realms, worlds and universes in which they live. Contrary to this, Enlightened beings or Buddhas, naturaly and karmically manifest Pure Lands or Enlightened realms. If a so called "supreme being" created a world like ours that means he is not enlightened, because if he was enlightened this world would have been perfect and inhabitted by perfectly enlightened beings. Amida Buddha (and any Buddha!) does not pretend to be the creator of this samsaric world, but only of His enlightened Pure Land, where He vowed to bring all samsaric beings for their final liberation (attainment of Buddhahood/Nirvana). A flickering lamp — a phantom — and a dream. If Buddhism denies the idea of a creator-god, then how it explains the existence of the various worlds and universes? First of all, when it refers to worlds and universes, the Buddha Dharma explaines them as places of rebirth, or Samsaric realms. Thus, they are inhabited by unenlightened beings in various stages of spiritual evolution or involution. As far as I know, most of the monotheists give the following argument in the support of their belief in a supreme creator-god: “if you see a house in a field you ask yourself who built it. In the same way, this complex world is the creation of our god. Anything that exists has a creator”. This is the basis of their belief system, but for Buddhists the matter is wrongly addressed here. Yes, indeed, everything has a creator, but not in the way the monotheists think. I would rather say, every dream has a creator – the dreamer. And who is the dreamer? It is us – the unenlightened beings with our specific individual karma, but also with the collective karma or the karmic connections we create among us. I am very much worried that nowadays, many people from inside or outside the Sangha spread the idea that Shakyamuni Buddha did not deny nor affirmed the existence of God. Thus, they somehow imply that the World Honored One left the door open for interpretation and that it is ok for a Buddhist disciple to believe in a Creator or supreme God. Well, this is a great delusion and a falsification of Shakyamuni’s teaching. In fact, the Buddha clearly denied the existence of a supreme being who created the world, rules the world and will one day judge the world. 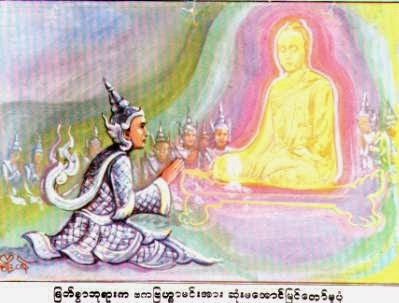 In this short article and others that will soon follow, I do not have the intention to enter into any debate or polemics with followers of other religions on the existence or non-existence of such a supreme being, but just to prove that Shakyamuni Buddha clearly denied this view and considered it a false and dangerous illusion. For me the most important thing is not what monotheistic religions say, or if some chose to believe in a creator god (its their choice), but what the Buddha actually said and preached. So, if we consider ourselves to be His diciples, we ought to know His position on this topic and follow it faithfully. It is well known that among the many religious and philosophical traditions that were contemporary with the Buddha, the idea of a supreme being who created and sustains the world was well known and shared by many. This is exactly why, He did not kept silence, but preached against it.